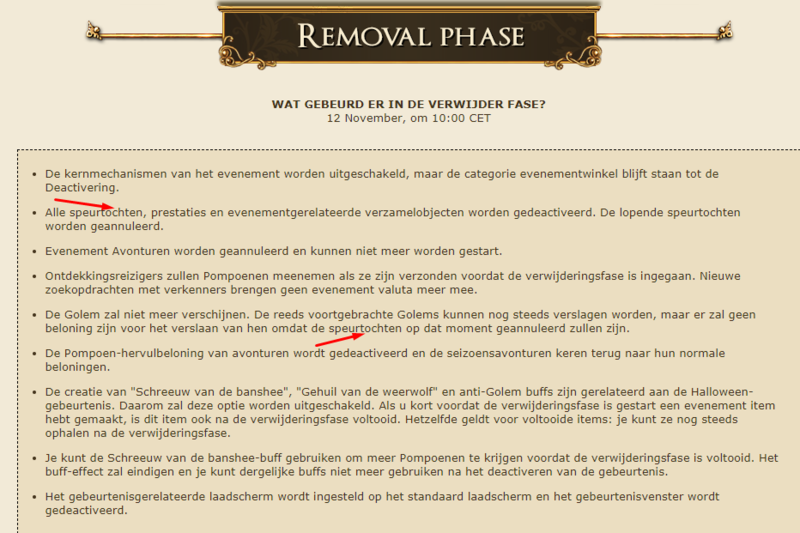 Het klopt toch dat de velden blijven staan en blijven opbrengen tot bij de volledige deactivatie van het event? ja nog moeilijker om ze gevuld te houden, je moet je suf spelen. Thanks for pointing this out. I have forwarded this to the development team. for the next year/ events: can we please have some adventures that are actually rewarding to play together? This event it's simply more profitable to play adventures that require you to play solo. I dont like it, it's not much fun, I like the team spirit. Doesnt have to be only coops, but as it stands, Mary is the way to go for me now, sadly. Laatst gewijzigd door avonturier; 08-11-18 om 19:01. Hij is zelf degene met de onduidelijkheden... blijkbaar. Als BB dan toch het woord "Missies" naar Queestes meent te moeten veranderen, zou het dan aub wel goed vertaald kunnen worden? 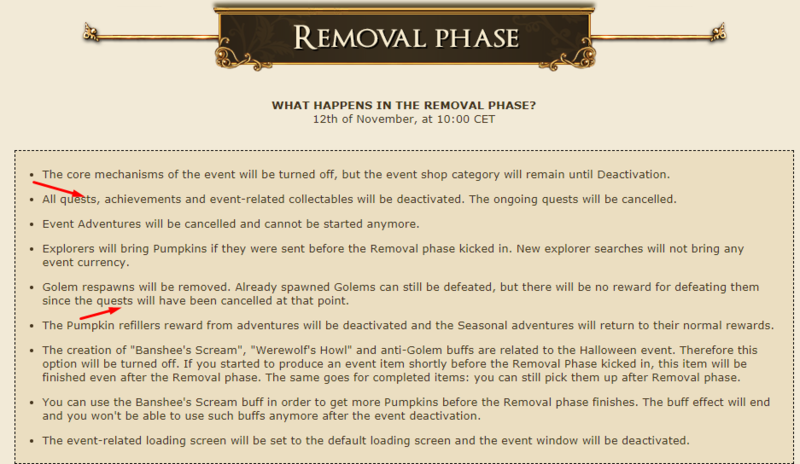 Will the pumpkin fields still work after removal phase one? It's a bit unclear and I think it's important to know, because I would need to buy a lot of fillings (with pumpkins). I don't want to loose all my pumpkins because of a misunderstanding of the information provided. Could someone from BB answer this question? Many players say they will work untill the second removal phase, but some state they won't as was custom in previous years. JA! en het is niet unclear, er is er maar 1 die het tegendeel beweert en die is slecht geïnformeerd. En daarbij was dat in voorgaande jaren ook zo. BB veranderd niet snel iets aan een event, dus je kan lekker dooroogsten. Daarbij is dit een nederlandstalig forum... Engels mag om Sious te dienen, maar nederlands moet er wel bij. Laatst gewijzigd door copycat; 09-11-18 om 18:11. I am pretty sure that you have noticed it by now. Pumpkin cemeteries are not removed during the removal phase and if you were able to collect a lot of pumpkin refills during the event, you can still place these and they will continue to run until complete deactivation.